“Only two electrons can occupy an orbital.” Sounds like advice a marriage counselor might give to a couple after having finished reading a biography of physicist Niels Bohr. How about if the counselor continued to say, “It is impossible to simultaneously, with arbitrary precision, specify the position and momentum of a particle.” Wait you lost us. Are you saying that we need to focus on the bigger picture of our relationship and not the nitpick the details? “Yes and No. I’m saying that you need to recognize that there will always be uncertainty in your relationship. It will always change in ways you won’t expect.” Oh. At the turn of the 19th century, the first experiments to observe subatomic particles were conducted, including the famous “Gold foil experiment” which discovered the existence of an atomic nucleus. The “planetary model” of an atom with an electron orbiting around a nucleus was proposed, and still holds most of our imaginations, as it is used by many to symbolize the atom, including the US Atomic Energy Commission. But when Werner Heisenberg introduced his theory of “uncertainty” as it applies to quantum mechanics in 1927, this model failed. You couldn’t know both where that electron was and how fast it was going around a nucleus. Suddenly, there were limits to what science could measure precisely. In fact the act of measuring would affect what you were trying to measure. Ok, Scotty and Kirk never had that dialogue, but Heisenberg Compensators needed to exist in the Star Trek Universe, otherwise everyone would have been transported into mush. Physical Chemistry is the first work that I created that would fall in the genre of artist’s book. 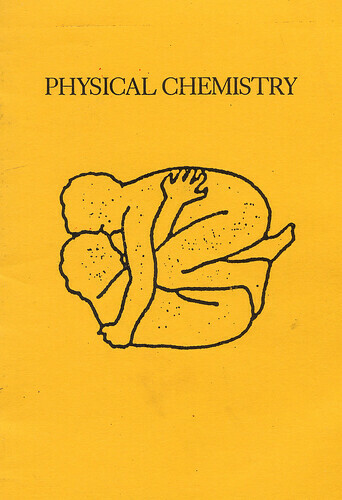 It could be seen as a manual for the Heisenberg Compensators, explaining the unexplainable, using diagrams of group yoga/dance to solve many of the atomic (physical) chemistry axioms I learned as an undergraduate chemistry major. I imagine that these are all the various contortions your body would necessarily move through during transport to keep you from turning into mush. Or maybe the book is a self help manual for working on your relationship – from a quantum mechanical perspective. “Because there is interaction between the two electrons in the potential energy term the values cannot be made independent of each other.” What? “Don’t expect to have a solid relationship unless you constantly work at it.” Ok, that’s what I thought you said.